The sharks think maybe we'll feed them. Dive Journal: The afternoon dive takes us fairly far south away from Small Hope Bay Lodge, closer to the Naval sonar and weapons research facility called AUTEC (Atlantic Undersea Test and Evaluation Center). Brad’s Mountain is also named after a former SHBL divemaster. Shannon’s briefing also mentions that this dive is adjacent to the site used for the “Shark Emporium” dive, and that sharks often think the boat is here to feed them at Brad’s Mountain. 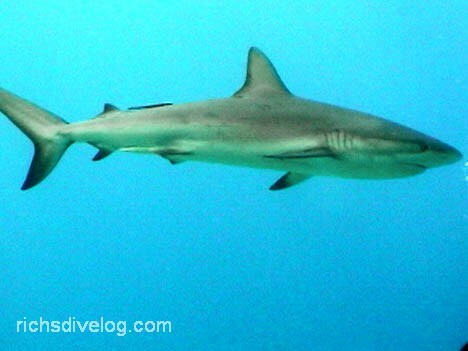 As soon as we’re in the water, the sharks are cruising about, all Caribbean reef sharks. The site consists mainly of a big hill in about 50 feet of water that crests all the way up to about 20 feet. Shannon’s mentioned that the shark site is south of us, so we swim around the base of the hill and then head on a heading south to explore. We come across a rather large turtle. As we swim south, the sharks seem to follow us but swim in E-W lines that cross our path. There are plenty of other fish here, including lots of chub (some spotted), creole wrasses, parrotfish, and small groupers. Seeing the sharks pass every few minutes, though, is the highlight of the dive. Following dinner this evening, French guests Jean-Louis and Francois show an hour long video of their diving in the Maldives. Some of the imagery is sensational, including wonderful clear-water manta ray, whale shark footage, and delightful classical dance music.